A diamond dress ring. 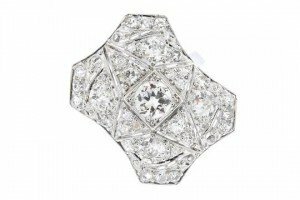 The circular-cut diamond and single-cut diamond angular panel, with pierced star and scroll motif. Estimated total diamond weight 2cts. 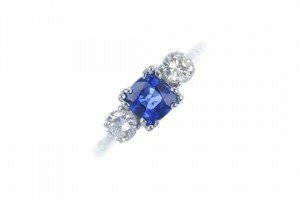 A sapphire and diamond three-stone ring. The cushion-shape sapphire, to the brilliant-cut diamond shoulders and tapered band. Estimated total diamond weight 0.55ct. A ruby and diamond bracelet. Designed as a series of circular-shape ruby collet articulated panels, between brilliant-cut diamond geometric sides, with rectangular-shape ruby line channel-set spacers, to the similarly designed concealed clasp. Estimated total diamond weight approximately 2 to 2.50cts. 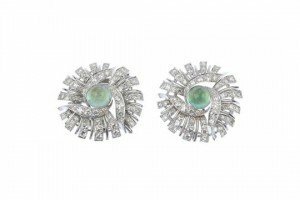 A pair of diamond and emerald single stone ear pendants, set with clustered diamonds to the surround. 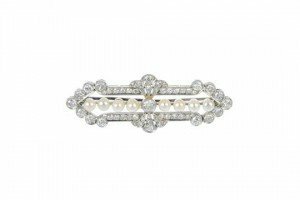 A mid 20th century platinum diamond and cultured pearl brooch. The central circular-cut diamond and cultured pearl line, with old and single-cut diamond stylised fan sides, overlapping a similarly-cut diamond scrolling bar and chevron surround. Estimated total diamond weight 1.50cts. 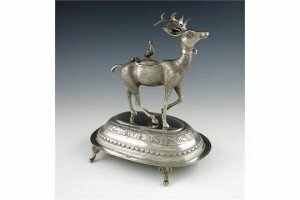 A 19th century Peruvian silver incense burner, modelled as a standing stag with a hinged pierced cover and a bird finial, on an oblong base on four scrolling feet. 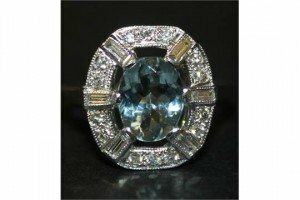 A white gold aquamarine and diamond oval cluster ring, claw set with the oval cut aquamarine in a surround of circular cut diamonds, with baguette diamonds mounted at intervals. 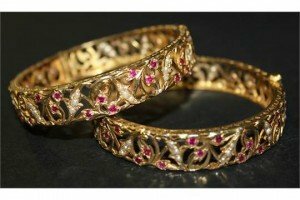 A pair of gold, seed pearl and red gem set circular hinged bangles, probably Indian, each with foliate pierced decoration. 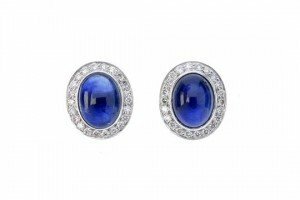 A pair of sapphire and diamond cluster ear studs. Each designed as an oval sapphire cabochon, within a brilliant-cut diamond border. Estimated total diamond weight 0.45ct. 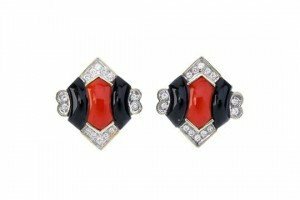 A pair of coral, diamond and onyx earrings. Each designed as a coral cabochon, between curved onyx panels, to the brilliant-cut diamond edges and sides. Estimated total diamond weight 0.25ct. 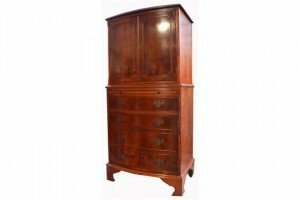 A contemporary cocktail cabinet, with twin doors opening to reveal mirrored section above long drawer and single door cupboard section with false handles on bracket feet. A Napoleon III ebonized and boulle marquetry side cabinet with ormolu female figurine mounts to either side, the white marble top above a panel of boulle work of scrolling foliage and birds, the two doors with raised step ormolu decoration framing oval panels of floral scrolling decoration on a raised curving plinth. 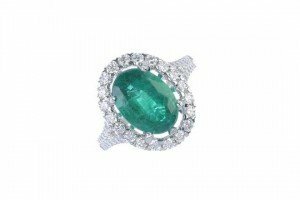 An emerald and diamond cluster ring. The oval-shape emerald, within a brilliant-cut diamond border, to the similarly-cut diamond bifurcated shoulders. Total diamond weight 0.68cts. 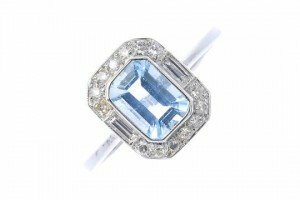 An 18ct gold aquamarine and diamond cluster ring.The rectangular-shape aquamarine, within a single and baguette-cut diamond octagonal-shape surround. Estimated total diamond weight 0.20ct. 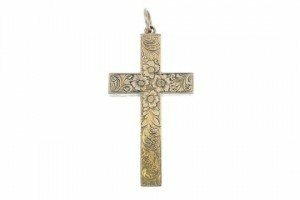 A late 19th century 9ct gold cross pendant. The scrolling foliate engraved panel, to the similarly engraved sides, with intertwined line engraving to the reverse. 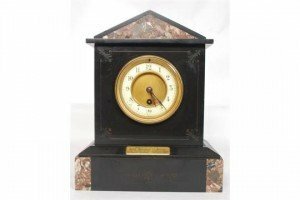 A Victorian slate and marble mantel clock having brass plaque to centre being presented to Rev Norman from the Sunday School of St Marys Kilburn 1895. Brass movement complete with pendulum. 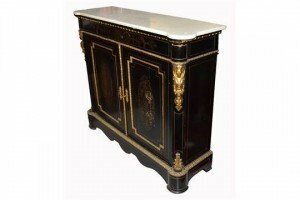 A good quality near pair of French marble top bedside chests / cabinets. 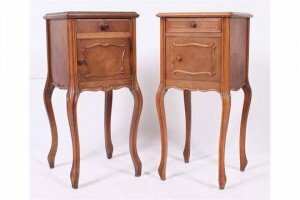 Raised on slender supports having a series of drawers. All finished with embellished borders having red and white marble tops respectively. 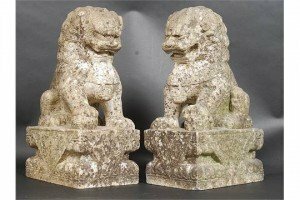 A pair of 19th century or earlier carved marble temple lion dogs – fu dogs. Raised on square plinths having well carved figures to each being realistically carved, each with one front foot on sacred pearl. 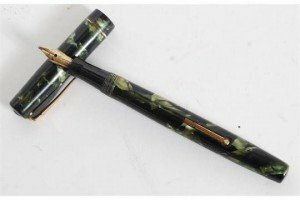 A vintage Mable Todd & Co Swan Self Filler Fountain pen in a marble effect cap and stem with marble effect. 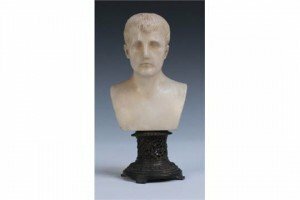 A late 19th Century carved white marble head and shoulders portrait bust of Napoleon, raised on a pierced bronze pedestal.